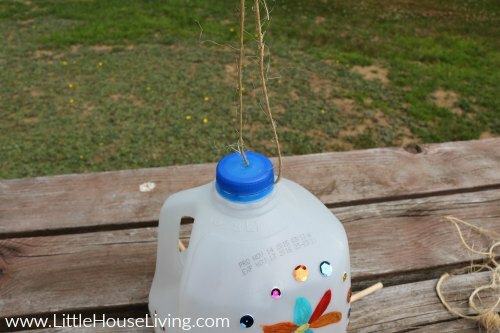 Today Angela is showing you how to make a Sequined Milk Jug Bird Feeder with the kids and watch all the birds in the neighborhood flock to it for a snack! 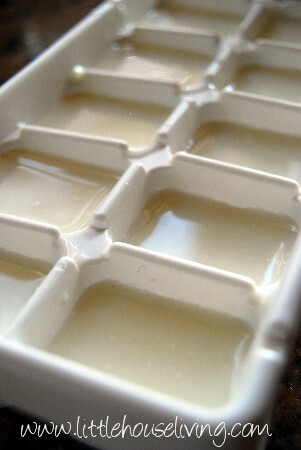 I love projects I can do with the kids that use items from our recycling bin. 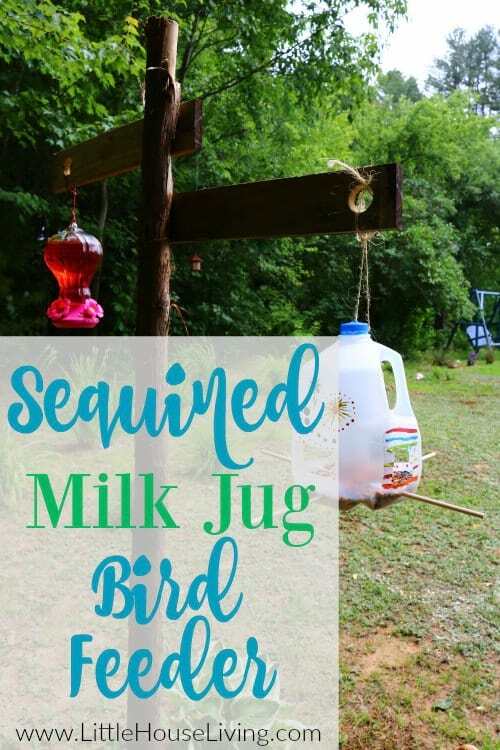 This fun Sequined Milk Jug Bird Feeder is a great way to upcycle an old milk jug, and talk to your kids about the importance of recycling. In fact, this whole project is a great way to start a conversation about science and nature. My son is very math and science oriented, while my daughter loves to be creative, so this was the perfect craft project to do together. They both love watching the birds come to eat from their creation. Now the sequins and whatnot might seem a little silly, but I have to tell you that the bright colors and shine will attract the birds. In fact, the photo of the bird on our feeder was taken within 15 minutes of hanging it! Start with an empty, clean milk or water jug. 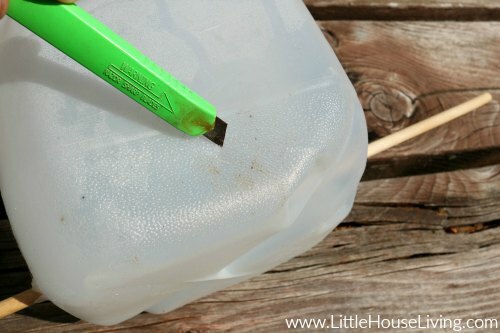 Use the razor knife to cut a small X on each side of the milk jug. 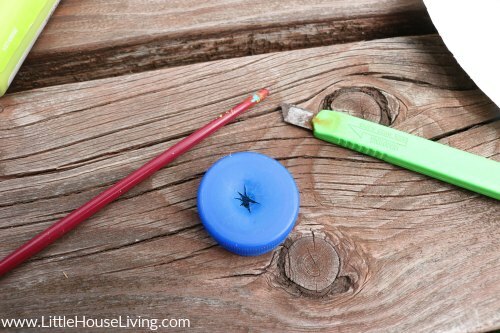 Slide the wooden dowels or twigs through from one hole to the opposite hole. These are the perches! Cut a rectangle out above each perch. 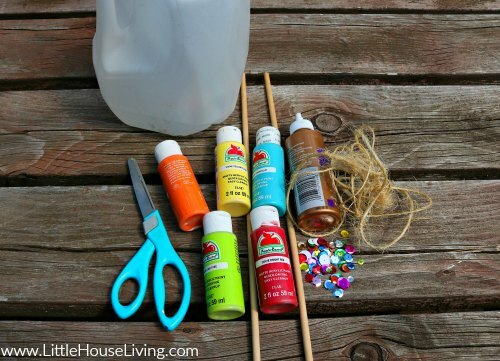 Glue sequins or glitter and paint as desired. 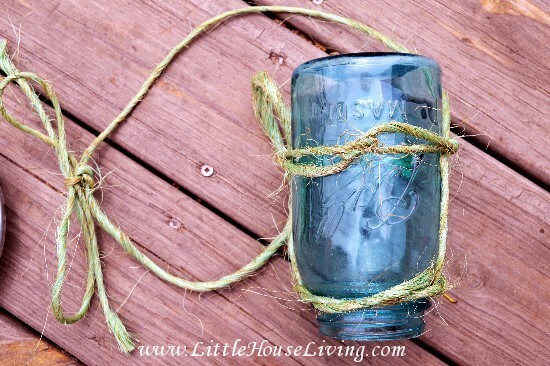 Cut a hole in the cap and thread the twine through. 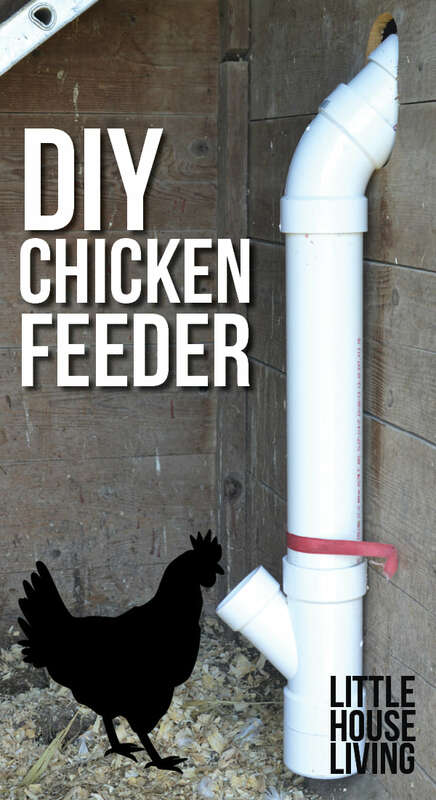 Fill the bottom of the feeder with seed, screw the cap back on and hang! TIP* It is easier to fill the feeder from the top than the sides. 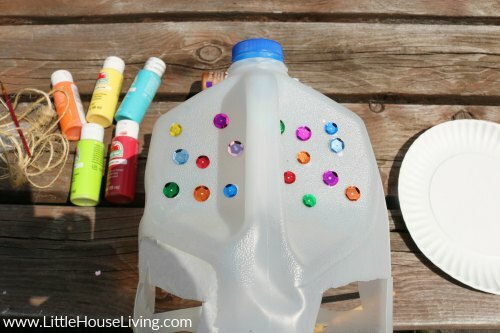 I hope you will enjoy making a Sequined Milk Jug Bird Feeder with your family soon! 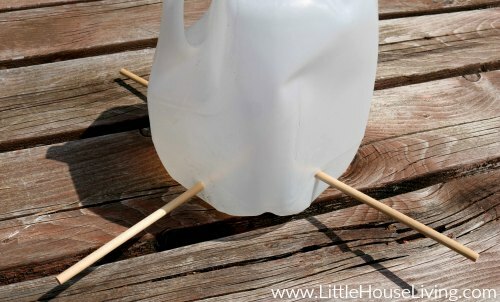 Do you have any other great uses for milk jugs? I’m Ang from Juggling Act Mama – a lifestyle blog where I share recipes, crafts and DIY projects and more for busy moms that want to do it all. Very cute idea for the kids; as you said, they learn about recycling and nature. Can’t beat that! 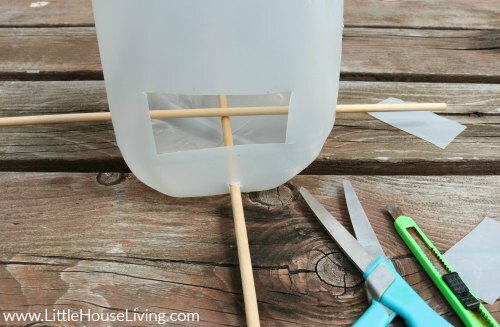 What a fun project for kids – with fall and winter coming, the birds will need this! Would love it if you shared on the Pleasures of the NWs DIY linky! 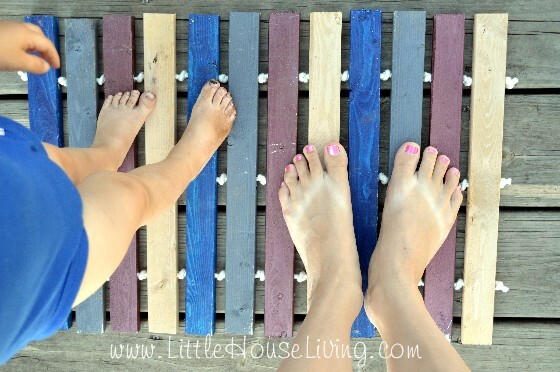 very clever, my little one would love to make this…. I love the sequins! 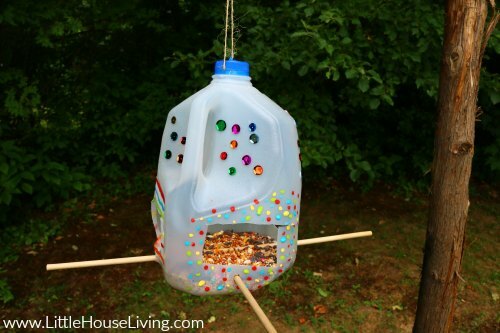 A little bit of bling for your bird feeder is so fun and recycled crafts are always the best. Thanks for sharing your tutorial with us at Merry Monday this week! Very cool! How squirrel proof is it? I would love to make one for my bf’s infant daughter, but he has a couple squirrels that live in his yard and I’m concerned they would decimate this.